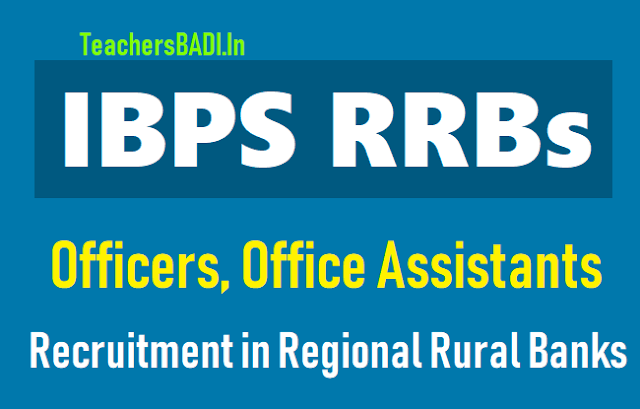 IBPS RRBs Officers, Office Assistants Recruitment 2018 in Regional Rural Banks: IBPS RRB Exam 2018 Notification released, apply online for 10,172 banking jobs on ibps.in from June 8. Institute of Banking Personnel Selection, IBPS has released the notification for IBPS RRB Examinations Phase VII. The notification was released on the official website ibps.in. As per the official notification, a total of 10, 172 banking jobs or vacancies would be filled by means of the IBPS RRB Recruitment Examination 2018. The details of posts under RRB Officer Scale I, II and III as well as RRB Office Assistant are provided below. Candidates interested in applying for RRB Officer Scale and Office Assistant posts can apply online from June 8 on ibps.in.Candidates are informed that only online applications would be accepted. Also, candidates applying for Office Assistant are also eligible to apply for Officer Scale I, II or III postions. However, candidates cannot apply for Officer Scale I, II and III simultaneously. Check important dates, eligibility, details of vacancy and how to apply for IBPS RRB Exam here. Institute of Banking Personnel Selection, IBPS RRB 2018 online application forms are currently being accepted. IBPS had released the IBPS RRB Officer Scale I, II and III as well as IBPS RRB Office Assistant 2018 recruitment notification. A total of 10, 190 posts of Officer Scale and Office Assistant would be filled by means of IBPS RRB Exam 2018. The online applications are available on ibps.in till July 2, 2018.RRB or Regional Rural Banks are distributed across the country. Recruitment at clerical level or office Assistant and officer level or Officer Scale I, II and III would be done on the recruitment process under the IBPS RRB Exam 2018. Selection process for IBPS RRB Office Assistant and IBPS RRB Officer Scale I include a preliminary examination followed by a main examination. For IBPS RRB Officer Scale II and III, the admission process includes only a single level examination which is conducted along side IBPS RRB Officer Scale I Main examinations. Candidates interested in banking jobs are advised to go through the official notification and fill the online application forms at the earliest. Only online application forms would be accepted. Candidates are also required to pay the fee online to complete the online application process.The IBPS RRB Officer Scale Prelims 2018 are scheduled for August 11, 12 and 18. The Prelims for IBPS RRB Office Assistant would be conducted on August 19, 25 and September 1, 2018. Candidates are again advised to go through the notification carefully before filling the online application forms on the official website ibps.in. ప్రాంతీయ గ్రామీణ బ్యాంకుల్లో వివిధ విభాగాల్లో 10,190 పోస్టుల భర్తీకి ఇన్‌స్టిట్యూట్‌ ఆఫ్‌ బ్యాంకింగ్‌ పర్సనల్‌ సెలెక్షన్‌ (ఐబీపీఎస్‌) కామన్‌ రిక్రూట్‌మెంట్‌ ప్రాసెస్‌ (సీఆర్‌పీ ఆర్‌ఆర్‌బీ VII) నోటిఫికేషన్‌ విడుదల చేసింది. ఐబీపీస్‌ ప్రస్తుత నోటిఫికేషన్‌ ద్వారా భర్తీ చేస్తోన్న పోస్టులకు సంబంధించి ఖాళీలు ఇలా ఉన్నాయి. 5249 are for IBPS RRB Office Assistant. Also the break up of Officer Scale I, II and III is as given below. Also, the basic educational qualification for Officer Scale posts vary according to the posts applied for. Candidates are advised to go through the detailed notification for the same. Candidates interested in applying for the posts are required to register online and fill the online application form. The facility to apply would start from tomorrow, June 8, 2018 and would be available on ibps.in till July 2, 2018. Mba distance learning is the mode of imparting education that contracts time and freedom between the instructor and the student due to geographical or time constraints. These programs have been specially considered to help meet the best needs. Fashion industry is one of the fast growing industry which is having huge number of career opportunities. There are many fields in the fashion designing, so that one can choose according to their interest. Basic job of a fashion designer includes designing the dresses, suits, pants and skirts, and accessories such as shoes, for consumers. Engineering is a field which is having so many job options with good packages. it offers reputed jobs and one can find best offers in government as well as private fields also. XAT 2015 dates are out. The exam will be held on January 4th 2015 from 10.30 am to 1.30 pm.The registration for XAT 2015 will commence from August 12th 2014 and continue till November 22nd 2014.The exam will be held in 47 cities across India.All about the XAT 2015 Entrance Examand the Procedure to applyXAT 2015- Xavier Aptitude Test (XAT), conducted by XLRI Jamshedpur, is a national level MBA entrance exam. XAT 2015 scores are will be used by XLRI Jamshedpur, Xavier Associate Management Institutes and over 100 B-schools across the country for admission to various MBA programes.